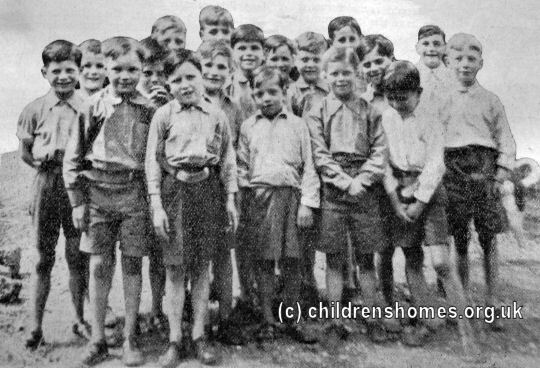 The Rudolf Memorial Home for Boys was opened by the Waifs and Strays Society in 1935 on Thornton Road, Clapham Park, Balham. The building had previously been occupied by the Society's St Winifred's Home. The new home was one of the two to be established in memory of the Society's founder, Edward Rudolf, who died in 1933, the other being the Rudolf Memorial Home for Girls in Dulwich. The location of the home is shown on the 1954 map below, by which date the St Luke's Home occupied the premises. Former Rudolf Memorial Home for Boys' site, Balham, c.1954. Both the new Memorial Homes were intended for children with educational problems (what were then often referred to as 'backward' children) and for 'those who, while not mentally defective, have serious psychological troubles, due, it may be, to ill-health, cruelty, neglect, or fear which are likely to cause problems in later life if not addressed'. The boys' home at Balham was the first to be opened and was used by the Society to gain experience in dealing with children with behavioural and learning difficulties. The home was assisted and supervised in its operation by London Child Guidance Council. In other respects, the home operated much like any of the home's branches. In 1937, the children had a summer holiday by the sea through an exchange visit with the Leven and Melville Home at St Leonards on Sea. In the same year, a percussion band was started at the Balham home. In 1939, with the outbreak of the Second World War, the home was evacuated to Banstead. After the war, by then amalgamated with the Rudolf Memorial Home for Boys, it moved to Farnham in Surrey. During the war, the central part of the premises, number 16 Thornton Road, was used as the Society's central clothing depot, formerly at the St Elizabeth's Home in Clapham. The Thornton Road premises were re-opened as the St Luke's Reception Centre.